Robber barons were a group of powerful businessmen, named robber barons by the media, who felt they had gotten their sometimes hundreds of billions (in today’s money) through immoral and unscrupulous methods. Some robber barons made the equivalent of over $300 billion in 2016 dollars. Many of these people were the richest men in the world, at some point in their life. These men had unheard of power, even the most powerful businessmen today, think Bill Gates, and Jeff Bezos, have nowhere near the power these people had. This is a list of 6 alleged robber barons who had so much influence and power, you could say they ruled the United States of America. Carnegie was a Scottish immigrant who moved to a poverty ridden area outside of Pittsburgh as a child. He began working at the age of 13 in a textile factory. At 14 he became a telegraph messenger. This allowed him to meet many different businessmen and make valuable connections. Carnegie was smart, and was promoted many times as he got older. Eventually he was helping the Federal Government set up a military telegraph system, which played a key role in the Civil War. During the American Civil War, Carnegie began investing in different businesses, and these investments paid off. By the end of the war he was quite well off. 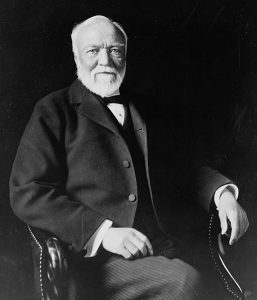 Carnegie travelled back and forth between England and the US selling bonds of American railroads and many other businesses. In England Carnegie became fascinated by the steel industry, and came to the conclusion that steel would be huge. He learnt as much as he could about steel and then went back to the US. By 1873 Carnegie had set up a company making steel rails. Due to numerous strategies Carnegie managed to outdo the competition and became one of the wealthiest men in America, eventually the wealthiest. Late in his life, Carnegie made the shocking decision to give away $350 million, which was 90% of his wealth. He wrote an article titled “The Gospel of Wealth”, which encouraged wealthy people to give away their money. A wave of businessmen responded to this by donating large amounts of money. “A man who dies rich, dies disgraced.”, Andrew Carnegie. Like many robber barons Fisk started out poor and became rich due to his intellect and hard work. He became rich working in the cotton industry during the Civil War. Some accounts say he made money smuggling cotton across enemy lines. This wealth, however, would soon be lost in Wall Street speculation. Fisk later worked for a man named Daniel Drew. He aided Drew in the Erie Railroad War, against Cornelius Vanderbilt. The war for ownership of Erie Railroad between robber barons, only lasted a few months, but was bitter and controversial that talking about it became taboo for years afterwards to avoid starting arguments. 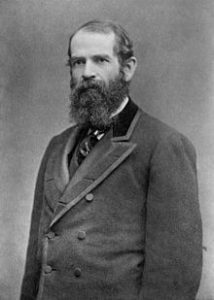 Fisk later went on to start an alliance with a politician named, Boss Tweed, and businessman named Jay Gould. This alliance included bribing legislators, and buying judges. Fisk got involved in a love triangle which ended his life, when he was shot inside a luxury hotel. Gould was only a small businessman at first, but made a fortune on Wall Street. Gould was like Fisk in that he was famous for using unscrupulous, underhanded methods to attain his wealth. He started an alliance with James Fisk in an attempt to corner the gold market. This conspiracy led to Black Friday, on 24 September, 1869. This was during a time in America’s history known as the Gilded Age, where President Ulysses S. Grant followed a policy of selling Treasury gold in order to improve the American economy. The pair attempted to befriend President Grant in the hop eh would provide them with insider information. This plan worked, not only did they gain insider information, but just being seen with the President improved their reputations. This led to them tricking Grant into suspending Treasury gold sales. The pair then started buying gold, which raised the price of gold. When Grant finally realised he had been tricked, he put a stop to their scheme by ordering the release of $4 million in gold. This crushed their corner on the market. If Grant hadn’t finally crushed the scheme, it could have caused a national depression. Instead, they only suffered a few months of economic turmoil. The dastardly pair even managed to escape prosecution, due to their connection with politician Boss Tweed. 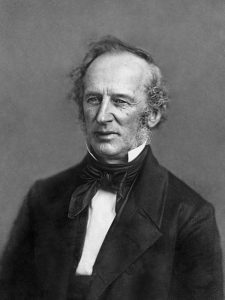 Vanderbilt was a wealthy industrialist in the 19th century, and one of the richest men in history. He was worth the equivalent of $215 billion dollars in 2016 dollars. Richer than the sum of both Jeff Bezos’ and Bill Gates’ bank accounts. He made his money by investing in the railroad industry, which saw rapid growth during this era. Known as “Commodore” Vanderbilt, he was ruthless, and shrewd. 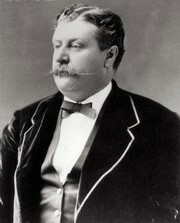 When he died in 1877 he was the richest man in America. Cornelius didn’t just build businesses he built empires. Under his control was both a shipping empire, and railroad empire. Vanderbilt started off in poverty, and had little education, but managed to learn everything he needed in order to build the largest shipping business in the world in only four decades. He saw how successful railroads were going to be, and sold all his ships to invest everything he had in the industry. Vanderbilt was among others labelled robber barons by the media, but turned his image around when he became a devoted philanthropist. 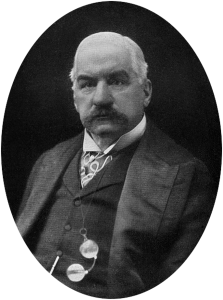 J.P Morgan is the man who made Carnegie the richest man in the world. J.P. Morgan asked Andrew Carnegie how much it would cost to buy his company, Carnegie wrote down on a piece of paper the price of $480 million (the equivalent of $300 billion), and Morgan paid it. He owned a third of a America’s railroads, and two thirds of America’s steel. Morgan was so influential on Wall Street, that when he died, the New York Stock Exchange closed for two hours in his honour. He was called on twice by US presidents to save the nation’s economy. Morgan was called both a robber baron, and a captain of the industry, two contradictory labels. Rockefeller is still famous today for his fortune, and shrewdness as a businessman. 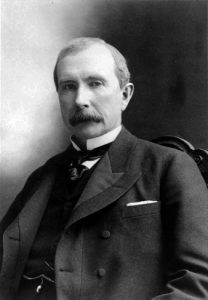 He owned Standard Oil, the largest oil refinery company in America, and controlled 90% of the oil in the US. Rockefeller owned a monopoly, and this monopoly made him more money than anyone before him. He was worth what would be $392 billion today. 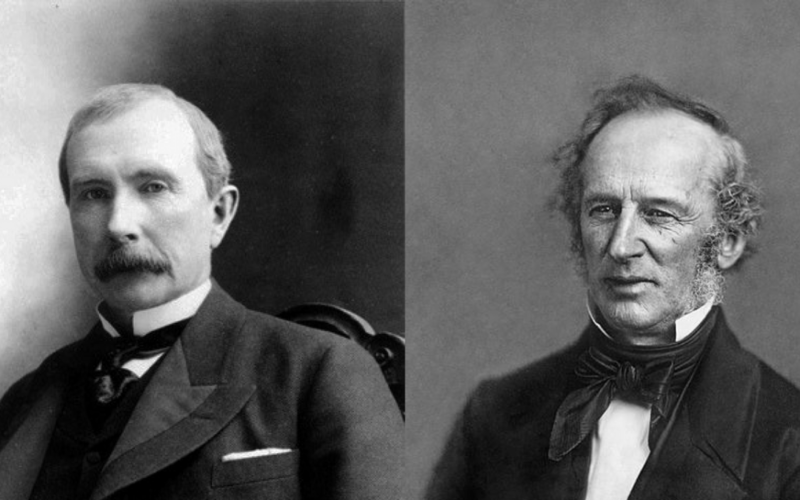 Rockefeller was a genius businessman, who went to war with Vanderbilt and won. Rockefeller was playing Vanderbilt and his competitor against each other, and coming out on top in the process. So, Vanderbilt did the unthinkable, and struck a deal with his rival, Tom Scott, to pull all of Rockefeller’s deals. If Rockefeller wanted to continue to transport his oil by railroad, he would have to accept defeat and let them win. Rockefeller, however, would not be outsmarted, and instead had the genius idea to build a pipeline to transport his oil instead. This pipe stretched 4000 miles long. This innovation threatened to cut the railroads out of the oil business completely, and now Vanderbilt was at the mercy of Rockefeller, not the other way around.